Creationism vs. Evolution: Ground-Breaking Discovery by Physics Engineer Solves Vital Facet of Origins Debate. In his new book, Engineering Physicist Daniel Friedmann shares his unique formula for converting ‘Bible Time’ to Gregorian years. Poised to provide compelling answers to the timeline aspects of the on-going Creation vs. Evolution debate, could the author’s new book be the answer both sides are fighting for? A new book by North American Physics Engineer, Daniel Friedmann, could be about to settle long-held differences between devotees to Creationism and Evolution. By connecting the dots that reconcile science and religion, ‘The Genesis One Code’ provides concrete answers to the origin of the Universe and life on earth. This epic discovery uncovers a highly-accurate way to convert ‘Bible Time’ to Gregorian years and thus the age of the Sun, Earth and the Universe as a whole. In fact, without any modifications, the formula consistently produces results that match scientific estimates. “The argument between evolutionists and creationists often heats up when timelines are discussed. For example, every word in the 6 Day Genesis describes the origins of the Universe. However, scientists have their own timeline of when the world came to be, in apparent direct contradiction to Genesis,” says Friedmann, who works as the CEO of a large aerospace company. At its heart, ‘The Genesis One Code’ explains how Friedmann developed the formula - 1,000 X 365 X 7,000 -- from references in religious texts. Multiplying these numbers shows that each Creation day is an epoch of 2.56 billion Gregorian years. Using this formula to calculate the age of the Universe gives 13.74 billion years, almost an exact match to science’s latest estimate published December 21, 2012 after 9 years of satellite observation. In Genesis alone, Friedmann's formula produces about 20 Bible/science matches for events related to the development of the universe and the appearance of life on earth described within its text. This makes the formula a discovery of truly monumental proportions. “I hope that it fills in some of the grey area between science and The Bible, while serving as the inspiration to unravel further mysteries between both sides of the debate,” Friedmann said. “Whether the reader enters this discussion from the purely religious side or from the purely scientific side, the one (of many) points that Friedmann makes is that there is no reason for combative separatism. His honesty and humility are most welcome, no matter the preconceived notions of the reader,” says Grady Harp HALL OF FAME/TOP 50 REVIEWER Amazon. “Readers with a knowledge-craving, open mind will thoroughly enjoy this read and be delighted by its many elements and propositions” says a Night Owl book reviews. With so much success on his hands, Friedmann refuses to lose sight of what is truly important. “I hope that at least part of the Origins debate can now be settled, so that we can start to focus on the ‘how’ and ‘why’. I encourage advocates of both ‘sides’ to read my book and then consider the other’s position,” he concludes. With the book expected to see high demand, interested parties are urged to secure their copy before it’s too late. 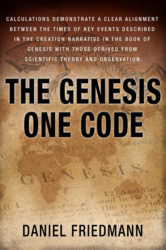 ‘The Genesis One Code’, published by Inspired Books, is available in paper back from Amazon: http://amzn.to/V4j3bc and by Untreed Reads in all ebook formats at your favourite online bookstore. Born in Chile and raised in Canada, Daniel Friedmann studies the origin of the universe and life on earth from both the scientific and biblical perspectives. He holds a master's degree in engineering physics and is CEO of a leading aerospace company. Through his writings, speaking engagements and appearances on television and radio, he wishes to help the young and all students of our world put science and the Bible into mutually comprehensible, and in turn respectful, contexts.